I wanted to learn about co-dependency because I wasn't completely sure what was meant by being co-dependent. This book is wonderfully written and is extremely informative. I wish I had read this book as a young woman so I could have been more aware of relationships with friends and others during that time of my life who may have been codependents. I believe reading this book as a young adult would help aide in figuring out personal issues (and relationships with others) sooner in life rather than later. Although the book also focuses on alcoholism, substance abuse and 12-step programs, there are many more topics in this book that relate to general life issues. Learning to love and accept yourself (and others), expressing yourself, setting goals and learning how to communicate properly are just some of the helpful topics covered. 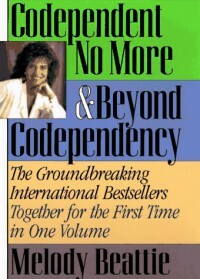 This book is actually a 2 in 1 book with 'Codependent No More' being published in 1987 and 'Beyond Codependency' being published in 1989. Melody Beattie, the author, is a recovered addict, alcoholic and codependent. The reason this book is so insightful is because Ms. Beattie wrote from the heart. She shares her experiences and those she has connected with vividly in this book. I must tell you that I started this book on February 11, 2014 and to my surprise I finished it exactly a year later. The reason I spread this book out over such a long period of time was because it is not 'light & fluffy' reading. It is intense and thought provoking. This was a borrowed book, but if I owned a copy I would go through the book again and highlight many insightful and smart advice that I could pass onto my daughters.